50 headline-news stories made possible in one year by FOIA. The bill reflects many of the findings of the National Security Archive’s FOIA audits and litigation and is on its way to the President’s desk – and the White House has indicated the President will sign it. Archive audits going back to 2009 show that most federal agencies have continued to ignore President Obama’s “presumption of disclosure” guidance that he issued on his first day in office. The new bill codifies this presumption, thereby requiring that records be released unless there is a foreseeable harm or legal requirement to withhold them. An Archive audit highlighted just how outdated many agency FOIA regs are. A 2014 National Security Archive audit found that too many federal agencies have not updated their FOIA regulations to comply with the 2007 Open Government FOIA improvements. By neglecting to update their “FOIA handbooks,” agencies are essentially ignoring Congress’s FOIA reforms. The new bill requires all agencies update their regulations within 180 days of the laws passage, including the new statutory language. The Archive’s lawsuits against the CIA and the State Department exposed those agencies’ practice of denying public access to historical documents (like the internal history of the Bay of Pigs disaster, and the telephone transcripts typed up by Henry Kissinger’s secretaries) by invoking FOIA’s “withhold it because you want to” exemption 5, on the grounds that their release would “chill” the official deliberative process. Neither the State Department nor the CIA claimed there was still classified information in those 30- and 40-year-old records, but relied instead on an over-broad reading of the exemption. The new FOIA bill mandates a 25-year sunset on the deliberative exemption and will curtail such senseless secrecy. Of course, as FOIA advocates learned last session, the passage of FOIA reform in both the House and Senate does not guarantee that the bill will become law. As such, the Archive and a broad coalition of other Open Government groups have mounted a wide-ranging campaign to celebrate FOIA’s upcoming 50th birthday on July 4, 2016, to help argue that the law needs to be reformed by then. 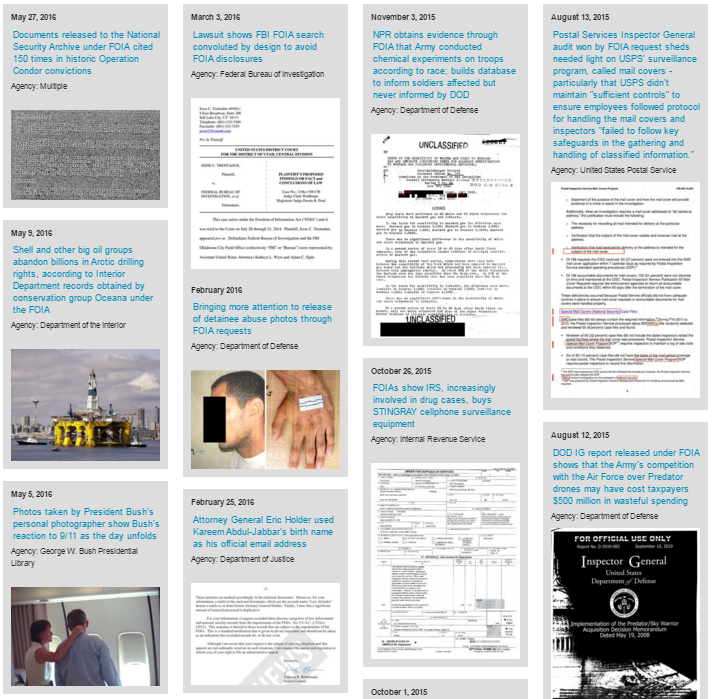 FOIA releases to the National Security Archive provided critical evidence in the historic conviction of 14 Argentine military officers and 1 Uruguayan military officer for their participation in the Operation Condor international murder ring and were cited 150 times by the prosecution. Documents released through FOIA proved Pentagon officials deliberately misled Congress on the Defense Department’s handling of sexual assault cases in order to undermine reform legislation. Documents released by the Food and Drug Administration under FOIA show that cheese marketed as being“100% parmesan” contained 0% parmesan – and some wood pulp. Government audits freed by a FOIA lawsuit show widespread billing mistakes – primarily overcharging – in Medicare Advantage program. The CIA’s recent release of documents on its torture program in response to ongoing FOIA lawsuits also represents significant FOIA victories. In response to an ACLU FOIA suit, the agency this week disclosed detainee transcripts describing the torture program, adding “first-person testimony to the growing historical record.” The CIA also released 50 documents this week in an overlapping FOIA lawsuit brought by Vice News’s Jason Leopold; the heavily-redacted documents reveal the graphic conditions that led to the 2002 death of detainee Gul Rahman at a CIA black site prison in Afghanistan. The releases are a step in the right direction, even as the National Archives and Records Administration continues to defer to the Justice Department’s dubious guidance and refused to use its authority to call the Senate Intelligence Committee’s report on the CIA’s torture program a federal record. 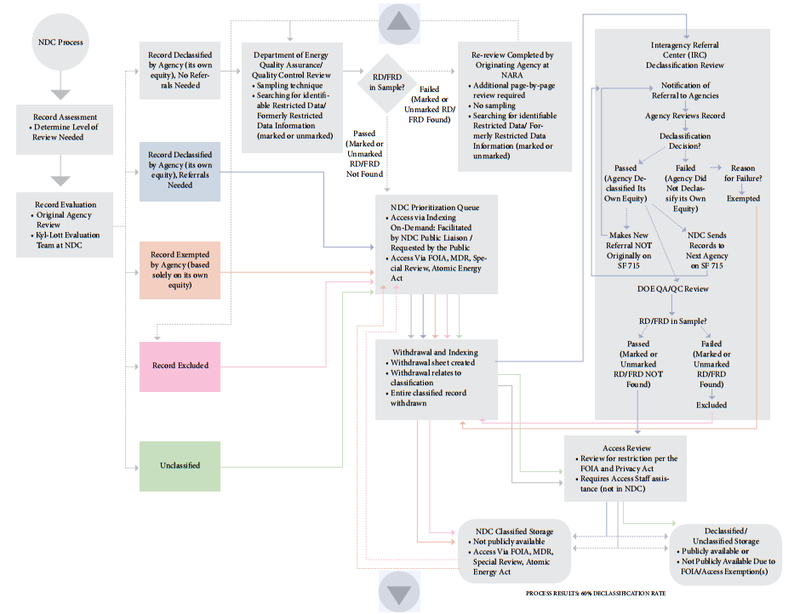 The current process for 25-year “automatic” declassification review, found in the PIDB’s December 2014 Report. In its December 2014 report the Public Interest Declassification Board wrote that the National Declassification Center must understand that “clinging to manually-intensive [referral] processes diverts increasing dwindling resources …There must be an understanding and agreement that the current practice of having one, two or more persons conduct a laborious page-by-page declassification assessment for each record under review is an unsustainable practice.” Ungar reiterates that sentiment in his Post piece, and urges the National Declassification Center to abandon its “factory” approach to declassification and embrace electronic declassification of sensitive documents. Government Attic posted Harry Markopolos’s March 13, 2014, presentation before the Council of Inspectors General on Financial Oversight meeting on the detection of the Bernie Madoff’s Ponzi scheme and the failure of the Securities and Exchange Commission to take action. The presentation was released thanks to FOIA. The Department of Health and Human Services is proposing to revise its FOIA regulations and comments are due by August 15, 2016. The proposed changes look – for the most part – pretty good, and include language allowing the department to waive fees as a matter of discretion. The regulations do not, however, reflect the D.C. Circuit Court of Appeals recent ruling that students are entitled to the same FOIA fee considerations as teachers. Thanks to Adam Marshall at the Reporters Committee for the Freedom of the Press for pointing out the proposed regulations. 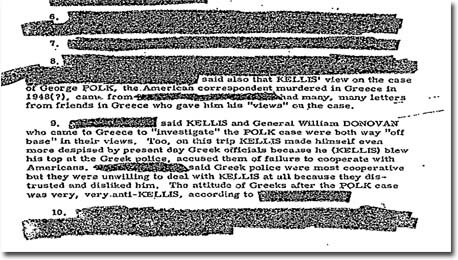 This week’s #tbt pick is the Archive’s 2007 posting on the George Polk case, and how the CIA lost documents concerning its investigation of the mysterious 1948 murder of the CBS reporter and destroyed its file on FOIA requests for Polk documents. Want to stay on top of the latest FOIA news? Click here to sign up for our weekly FRINFORMSUM email newsletter.